A classic 50s experiment (known as the Miller-Urey Synthesis) that showed how amino acids could be created from inorganic molecules and an electrical spark isn’t the whole story, it turns out. There were two related experiments, neither of which was reported at the time, which under modern analysis yield very interesting findings. One of these initial experiments actually produced a wider variety of organic molecules than the experiment that made Stanley Miller famous. 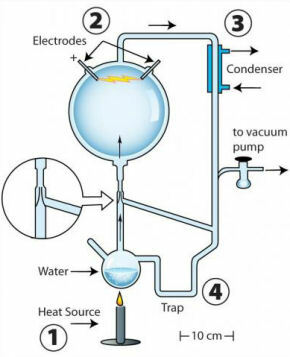 The difference between the two experiments is small – the unpublished experiment (pictured) used a tapering glass “aspirator” that simply increased air flow through a hollow, air-tight glass device. Increased air flow creates a more dynamic reaction vessel, or “vapor-rich volcanic” conditions, according to the present report’s authors. “The apparatus Stanley Miller paid the least attention to gave the most exciting results,” said Adam Johnson, lead author of the new assessment that appears in Science. “We suspect part of the reason for this was that he did not have the analytical tools we have today, so he would have missed a lot.” In his original 1953 article, Miller used a relatively primitive blotting technique to identify just five amino acids: aspartic acid, glycine, alpha-amino-butyric acid, and two versions of alanine. An answer to the second question is relegated to speculation – Miller, still a hero to many scientists, succumbed to a weak heart in 2007. Johnson says he and Bada suspect Miller wasn’t impressed with the second experiment’s results, instead opting to report the results of the simpler experiment. Miller’s third, also unpublished, experiment used an apparatus that had an aspirator but used a “silent” discharge. This third device appears to have produced a lower diversity of organic molecules.